One of the reasons people prefer to rent rather than buy a home is they don’t feel they need to worry as much about a place that isn’t theirs. While it’s true that, should a pipe burst or mold develop, it’s typically the landlord’s responsibility to handle it, that doesn’t mean renters are free and clear of worrying about living hazards. Security – up to a point – can fall under the tenant’s responsibility. And though there are security requirements your landlord should make, you should do everything you can to make sure your home and your property stay safe. Follow these important safety tips and rest a little easier tonight. This should be one of the first things you do or your landlord does for you. Remember, other people have lived in this property before. They’ve likely given out spare keys to their friends, babysitters, dog walkers and more. Any number of complete strangers could have a key to your home by the time you become the tenant. 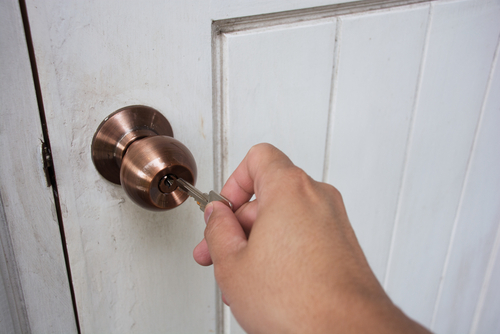 Ask your landlord to change your locks just before you move in. Don’t wait until you own a home to buy a surveillance system. Remember that many systems today are quite easy to install, take down and set up in a new location, so you’d be smart to own one no matter where you live—renting or buying. Your landlord may have some surveillance set up, but you have so little control over what is monitored or captured on those cameras. When you set up your own system, you decide where the cameras face, and you can check the archived footage as often as you want, without having to ask for passcodes or permission from a landlord. You likely won’t invest in permanent light fixtures if you’re just a renter, but you can find high-quality, portable lights—such as floodlights—to set up around your rental property. There are plenty of affordable, motion-sensor options available that will give you added security without digging too much into your wallet. Ask to vet construction companies, plumbers and the like. Who your landlord hires to fix something on his property is up to his discretion, but that doesn’t mean you can’t ask to see their license or credentials. Unfortunately, some landlords choose less-than-reputable companies and contractors to do work for them because they may offer better deals. But that could mean your safety is at risk. If you live on the property, you deserve to know who will be spending time there—near you, your family and your valuables. Many individuals don’t want to invest in a safe until they own a home and can buy a massive one permanently installed into a wall. But there are so many portable, affordable safes today. Neglecting to buy one, all because you don’t own your property, means you’re neglecting your valuables. Invest in a small safe for at least some of your precious items for now—you can upgrade to a larger one when you buy a home. Ask police to look at your home. You’re well within your rights to ask a police officer to inspect your home and notify you of any weak points. That officer can also alert you to any criminal activity that’s occurred in the area—important information the landlord may have neglected to mention. If your neighborhood is prone to car break-ins of vehicles parked on the street, for example, that’s something you should know. Being a renter doesn’t have to mean being powerless over your home security. There are steps you can take to secure a property, even if it doesn’t belong to you. Any reliable landlord will appreciate you doing so.